The role of Open Data in bringing down Northern Ireland’s interfaces – a challenging session to cover, given both the political sensitivities and the Chatham House Rule in effect, but it felt like the most important thing we discussed. I’ve worked on four of the five Open Data Camps now, and they’ve all been a powerful reminder of the potential of unconferences: small gathering of committed people discussing their interests without a formal agenda. In this particular event, bringing people together from both the public and private sectors to discuss what can be done with open data to make better public services, and better commercial businesses, is always compelling. It’s one of those jobs where you feel that you’re contributing to something that actually improves the world. The demographics of the people attending were quite fascinating. 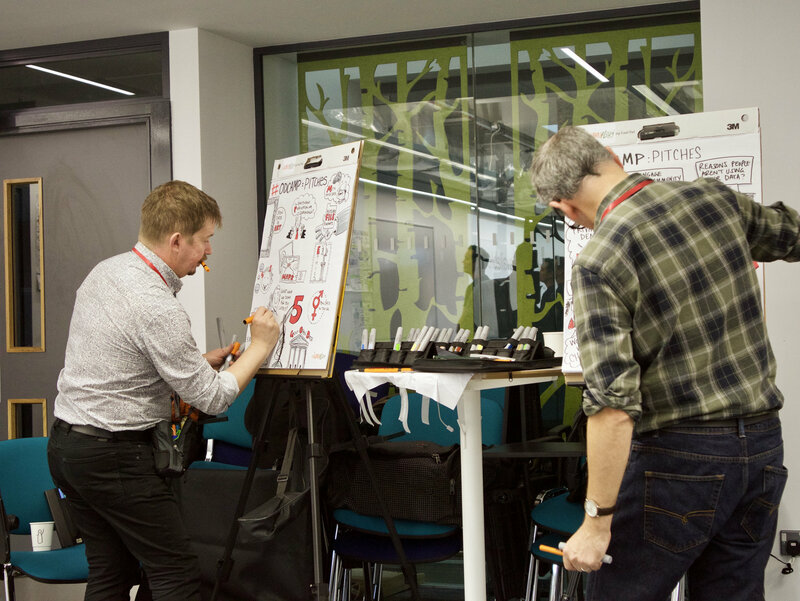 With so many of the digital journalism events, like Hacks/Hackers, adopting much more formal structures to cope with demand, I wonder if it’s time to look again at an unconference for digital journalism innovation? If you’d like too hire us for in-the-moment live event coverage and capture, please get in contact with the good folks at Drawnalism.